Oregon grape growers say herbicide drift is damaging vineyards and it’s time for the state to ban 2,4-D use during April to October growing season. Joel Meyers estimates herbicide drift has caused $50,000 damage in the past three years to vineyards he owns, leases or manages in Oregon’s Yamhill County wine country, and he’s had enough of it. An incident this spring wilted the leaves of a block of muscat grapes and likely will stop shoot development and prevent fruit formation, Meyers said. It’s the third year in a row he’s been hit and he blames fellow farmers — grass seed growers and a Christmas tree grower — who are using phenoxy compounds such as 2,4-D to kill broad-leaf weeds. Meyers, founder of Vinetenders, LLC., is one of the region’s most experienced vineyard managers, with 35 years in what has become an internationally-acclaimed facet of Oregon agriculture. He says herbicide drift damages grapes, blueberries, nursery stock and organic crops — all valuable and expanding sectors of farming. Meyers and other grape growers believe 2,4-D use should be banned from April through October, the growing season. Washington has taken that step and California has strict limitations as well. 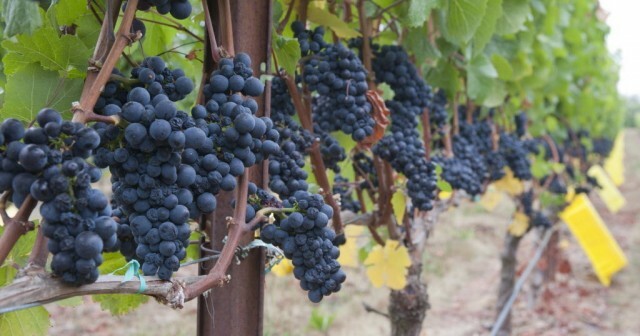 Vineyard operators are disappointed the Oregon Department of Agriculture hasn’t followed suit. The state ag department convened a spray drift committee to discuss the problem, and the next meeting is May 23. In the meantime, the Oregon Winegrowers Association is selling 18- by 12-inch warning signs that can be posted along roads or property lines. The signs read, “HELP PROTECT THIS VINEYARD. PLEASE DO NOT SPRAY HERBICIDES LIKE 2,4-D WITHIN 350 FEET.” Meyers ordered 20 of them. Tunnell and others acknowledge it’s a sticky situation when one group of farmers ask another to change their practices. Tunnell said attorneys have advised winegrowers that the Department of Agriculture could implement a “relatively straightforward rule change” to regulate phenoxy compound use. The department did so in the north central counties of Umatilla and Morrow because spray was drifting into vineyards in Washington state, which bans it from April to October, he said. Dale Mitchell, pesticide program manager for the ag department, said education, outreach and cooperation will reduce conflict between growers. An August 2013 analysis of spray drift complaints, done for the Oregon Winegrowers Association by the Portland law firm Davis Wright Tremaine, points out the complexity of the problem. According to the law firm’s analysis, the state ag department receives 10 to 20 vineyard spray drift complaints per year, 30 percent of them from Yamhill County. About 25 percent of complaints involve pesticide drift coming from vineyards themselves. Non-vineyard agricultural spraying, especially grass seed applications, are the largest source of complaints, while spraying by state and county road maintenance crews is a “significant” source of damage, the report said. Triclopyr use and phenoxy compounds such as 2,4-D cause the most damage. Read the full story via Capital Press | Oregon grape growers say drift taking toll on vineyards.